by Rahel Rao, Intern, Pratham Books StoryWeaver. All children love stories. Especially when the stories are told to them in an animated manner or the stories come with illustrations, bringing them to life. 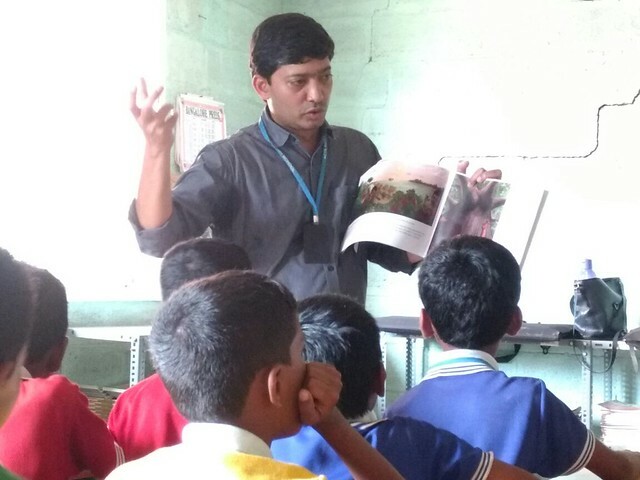 With this in mind, on the 21st of January, 2017, Oracle India Volunteers partnered with Mantra4Change and Pratham Books StoryWeaver to conduct a storytelling session at Citizens Schools in Bengaluru. The session was for classes 5 and 6 and the stories read to the classes were: Reeti and Mithu (Anupa Lal, Soumya Menon), Up Down, Down World (Padmaparna Ghosh, Sunaina Coelho), and Let’s Go Seed Collecting (Neha Sumitran, Archana Sreenivasan) along with a bonus story - Ammachi’s Amazing Machines (Rajiv Eipe) - read by Menaka Raman, from Pratham Books. All these stories sparked discussions about animal abuse, deforestation, and other such topics which the children had an acute awareness of and were ready to engage in discussions about - they only needed an opportunity to voice their views. The children enjoyed the sessions very much and their infectious enthusiasm made the experience better for the storytellers. You could see their faces lighting up when they realised that they were going to be told stories. They were alert and interactive throughout the sessions, ready to answer any questions asked and were even more excited when they realised that pictures were being taken of them. As Rashmi, an Oracle volunteer said, “[their reaction] was really awesome”. They clearly enjoyed the stories too. 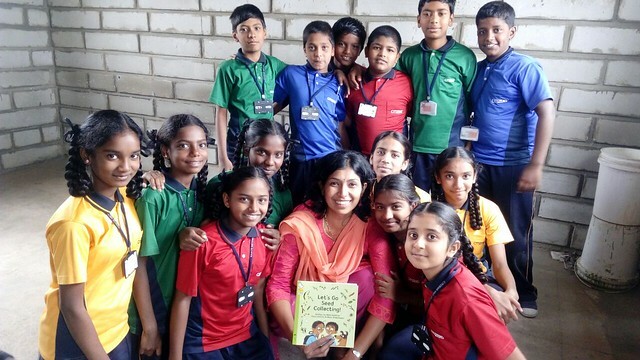 Oracle volunteer, Pranjala, said that the stories available on StoryWeaver are filled with so much positivity. She added that it was very important that children from the underserved sections of society get the right values, saying, that "stories are a wonderful way to impart values to kids at this age, which they can carry with them for the rest of their lives”. It was clear that initially the children weren’t very certain how to act around the storytellers. But they soon settled down, realising that it wasn’t a formal setting. This feeling was common even among the storytellers. Rajeshwari, who works with Oracle and was doing this for the first time, said that although she was a bit apprehensive when she heard that this was for the fifth and sixth grade, she found that they were really excited and later said that “overall it was a great experience” - an observation made by all the storytellers. Rajeshwari also brought a guest, who used to be a teacher in a playschool, to do a storytelling session. She said that “storytelling is not just an oral rendition, it's more of an art to get children involved. They learn faster through stories” and was very excited when this opportunity came to her. She said that the stories on StoryWeaver were “told in such an adventurous way” and so the “small things which have been added in the book which they [the children] tend to overlook” were brought to their attention through the discussions that followed each story. The entire morning was very heartening and the children even asked some of the the volunteers when they were coming back to do another session. Their level of interest and their love for stories was apparent, which only made the entire experience better and completely worthwhile. Menaka (left) and Rashmi (right) talking to a class after the storytelling session.